Communist Party, Turkey (KP) visited the Cuban Embassy in Ankara and delivered a message of condolences regarding the loss of Cde Fidel Castro. A committee representing the Communist Party, Turkey (KP) visited Ambassador Gonzales Casals for condolence in Ankara on 28th of November. 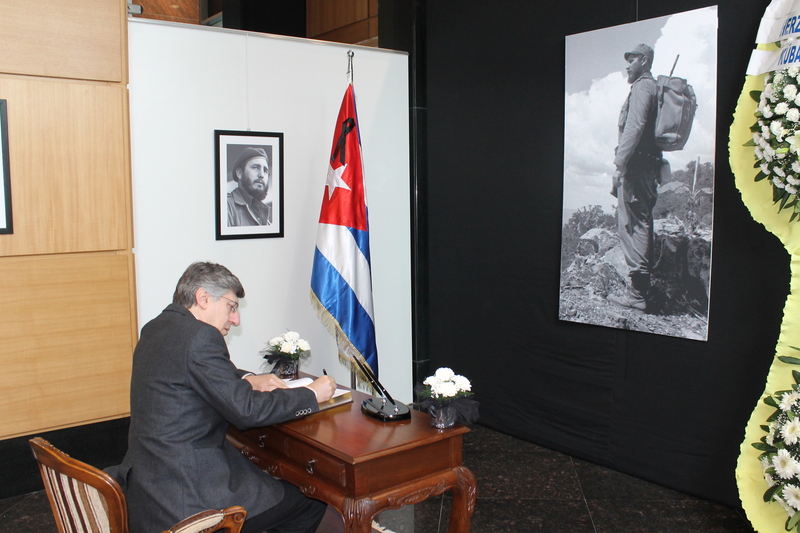 Member of the CC of KP, Erhan Nalçacı, put an entry at the book of condolences for the loss of Fidel Castro, on behalf of KP. At the message of condolence the people of Cuba were addressed and told that their deep grief regarding the loss of Fidel was shared by KP. The message also pointed out the great revolutionary character of Fidel as the vanguard of the working classes and the people of the world, who had conquered several victories against the colonialists, the imperialists and the exploiters thorough the previous century. Additionally, how this tiny and lonely island of the Caribbean repelled the dirty attacks of the USA and managed to continue building socialism by his leadership in the aftermath of the dissolution of the Soviet Union, was mentioned. KP's message of condolences concluded by stating the confidence in the Cuban people for, they will be preserving socialism and will stay as being the Polaris for humanity forever, even after Fidel.